Watching the Queen’s Diamond Jubilee river pageant, made me think of how much Nana would have enjoyed it. She loved everything royal, and while she was not always a regular reader of the Australian Women’s Weekly like Grandma Riddiford was, you could always count on her buying issues with the British royal family on the cover. Not to mention the special publications for events such as the marriage of Charles and Diana and the birth of their sons. 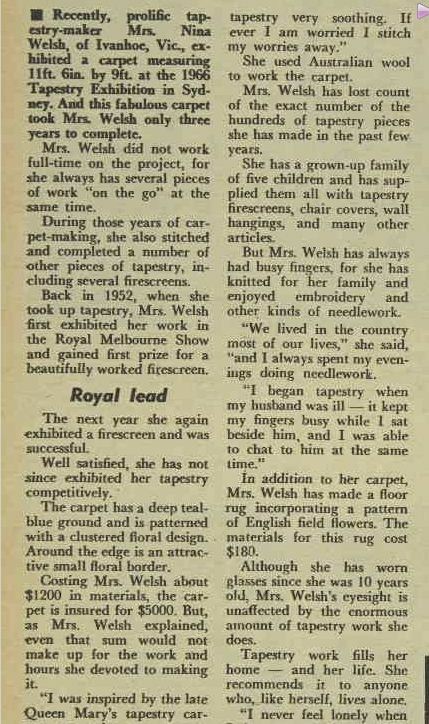 It also reminded me of an article I found at Trove of another Harman descendent and her link to the Australian Women’s Weekly and how she found royalty inspiring. Nina Harman was born in 1895 at Barnawartha, Victoria, daughter of Walter Graham Harman and Ann Gray, and grandaughter of George Hall Harman and Rebecca Graham. In 1921, Nina married engineer, Jonathan Welsh. 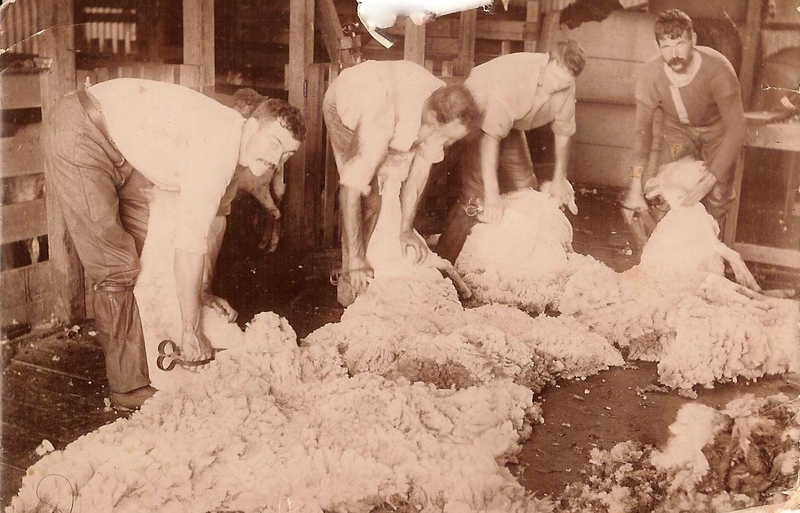 During the 1940s and 50s the couple were living at Wattle Vale, near Nagambie. 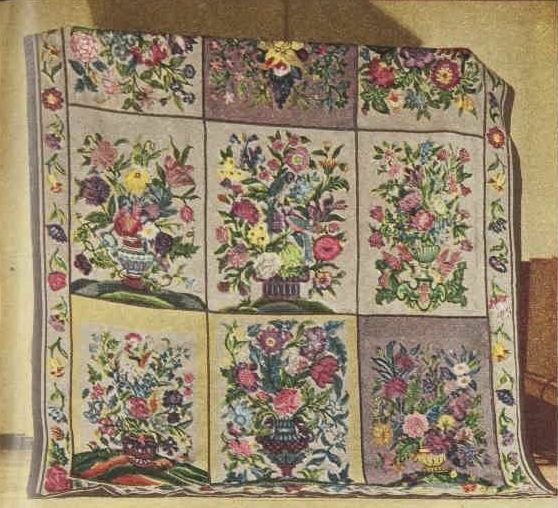 Nina took up tapestry around 1952 when Jonathan became ill as she found it “soothing”. They later moved to Ivanhoe, Victoria and Jonathan passed away in 1961. 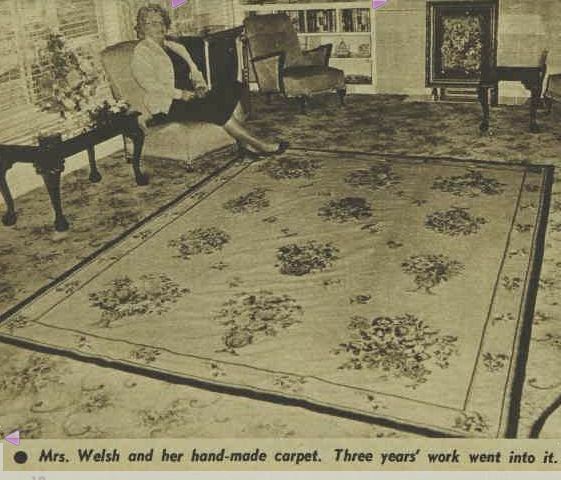 Her carpet, pictured in the “Weekly” on July 6, 1966, helped her overcome the loneliness brought about by the death of her husband. What amazes me is that the carpet cost $1200 in materials and was insured for $5000. How much would that be today? Queen Mary’s own tapestry carpet inspired Nina. 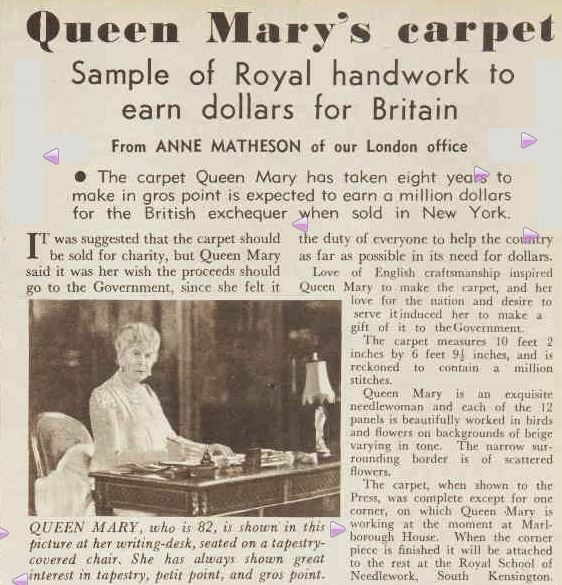 The Queen completed the carpet in 1950 at which time she donated it to the British Government to sell and retain the funds. 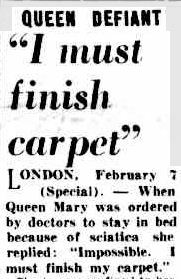 Queen Mary worked tirelessly on the carpet despite pain from sciatica. The Queen passed away in 1953. The following article which appeared in the Woman’s Weekly on April 8, 1950 may have helped inspire Nina. Nina passed away in 1985 aged 90. I wonder how many more tapestries she completed over the 20 years after her “Weekly” appearance? This entry was posted in Harman and tagged Harman, Welsh. Bookmark the permalink. What a lovely story highlighting Nina’s work. her pieces must have been quite valuable. Love Trove for making the story accessible, and the AWW for its stories about women. Great post! My Gran loved tapestry work and I am very proud of the tapestry that graces our living room wall that she made for me. She made several large pieces. I hadn’t heard of tapestry carpets until I read this post. Thanks for enlightening me!! Thanks Alex. Maybe Queen Mary inspired your Gran too. You are lucky to have one of her pieces.